On that menu, you will find a new “Messages for Web” feature that you use to scan the QR code from the site. Not everyone is seeing this feature in the Android app, me included. It would appear that Google is slow rolling this out this week so don’t be surprised if it takes a few days to get it on your phone. Once enabled, you will have the ability to send and receive text messages without having to physically touch your phone. Your phone does however have to be turned on (but the screen can be off) and you need to have your phone connected to WiFi. It is a great way to keep in touch without having to have your phone with you at all times. It should be noted that this is different than the recent Chrome OS commit that pointed to Android Messages integration. That commit points to more of a system level integration. This new feature rolled out today will work with just about any browser out there. 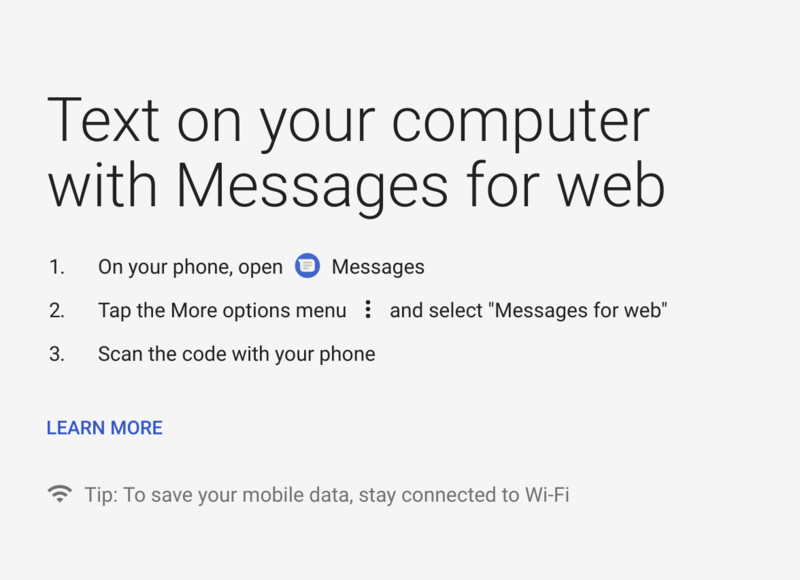 If you don’t see the ability to link up your mobile version of Android Messages and the new web site, give it a few days.